The leader of the extremist anti-assimilation group, Lehava, recently renewed his calls to torch churches in occupied Jerusalem, Israeli media sources revealed. Lehava’s leader, Bentzi Gopstein (pictured left), told the Israeli TV Channel II that Israeli Jews practically prevent Christians from entering Jerusalem, saying that Christian presence in Jerusalem was not welcome. He also called for “making obstacles towards the expansion of Christianity and Islam in the Palestinian occupied city of Jerusalem,” said the Days of Palestine on its website. Gopstein has previously “called for a ban on Christmas celebrations in the country and the banishment of Christians, who he referred to as ‘blood-sucking vampires’, from the land,” reported the International Business Times. 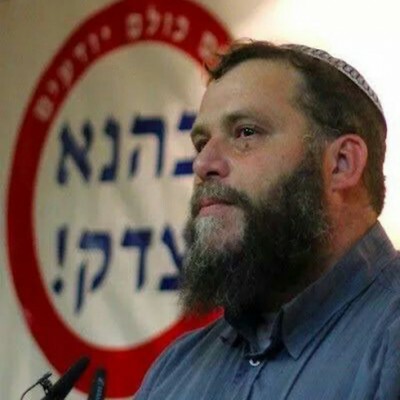 Gopstein is the head of the notorious extremist Israeli Jewish group of Lehava, which is responsible for insulting and harassing monks and nuns in the occupied Palestinian holy city. “Several Israeli groups are active in the occupied holy city regarding Judaization activities, including confiscating Islamic and Christian properties,” said Days of Palestine. In 2014, a group of mostly Jewish youth attacked the Church of the Multiplication’s outdoor prayer area along the Sea of Galilee, pelting worshippers with stones, destroying a cross and throwing benches into the lake. WAFA further reports that Israeli settlers, late Saturday night, torched eight Palestinian-owned cars in al-Thawri neighborhood in Jerusalem, according to media sources. The Israeli radio said that settlers set a car on fire in al-Thawri neighborhood, before the fire extended to seven other cars parked nearby. It said that Israeli police registered the attack against an “unknown” suspect, although surveillance cameras in the area prove that it was carried out by settlers. According to the Palestine Liberation Organization (PLO), there were 369 attacks by Israeli settlers against Palestinians from January 2015 to July 27, averaging more than 12 each week.